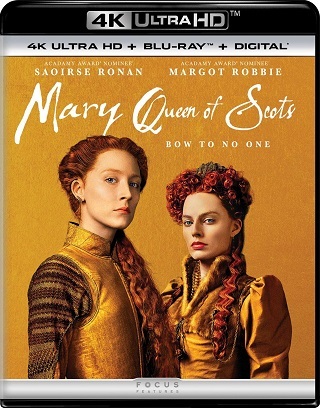 The 2018 film “Mary Queen of Scots” starring Saoirse Ronan and Margot Robbie is coming to both 4K UHD Blu-ray and Blu-ray Disc on February 26th, via Universal. The film, directed by Josie Rourke, co-stars Jack Lowden, Joe Alwyn, Guy Pearce, and David Tennant. Tech specs for the 4K include 2160p video presented in the 2.39:1 aspect ratio with Dolby Vision and HDR10 forms of High Dynamic Range and Dolby Atmos sound. Technical specs for the Blu-ray include 1080p video in the 2.39:1 aspect with Dolby Atmos sound. The 4K release (a “combo pack”) will come with a Blu-ray included, and both releases will come with a Digital Copy of the film included. Both the 4K UHD Blu-ray and Blu-ray both are available to pre-order now over at Amazon. Bonus materials set to be included on the release are listed below.